It sound warmer and there are less sibilance and bass is tighter as well, compared to the bypass buffers that comes with the amplifier. This one is really easy to make as well just solder a small wire joining pin 2 and 3, and another joining pin 5 and 6 on an empty socket. Using the single buffers supplied by the factory The output resistance between the L/R amp and the headphone is about 6 ohm. 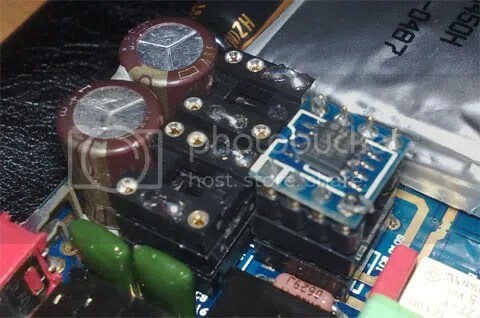 Using the double buffers it is reduce by half or about 3 ohm. Allowing the L/R amp better control of the phone. This combination sound really good. It is very good for battery life as well. But is only suitable if you have an easy to drive IEM or headphone. I assumed when you say “single buffer”, you are mentioning a normal bypass buffer (a wire between pin 1 and pin3 (pin 5&7)). When you double you make a shortcut between pins 1,2,3 and 5,6,7. Could you clarify this? Yes the buffer IC choosen by iBasso is a dual amplifier. Hence there are 2 op-amp to bypass. so if only 1 2 and 3 are shorted it is Single and if both 1,2 and 3 and 5,6 and 7 are shorted it is double. What the difference if we by pass single or double lies in the output impedance. As it is a dual amplifier, they cannot connect both output with a wire, but need to add a small resistor at each output before combining. By using a double buffer the output impedance is reduce by half. I would prefer to use a double bypass as there are also input resistor used at the input of the buffers stage. and this would appear in series with the output resistor if you use bypass buffers.